Heat 1 tablespoon oil in each of 2 heavy large skillets. Add 2 chicken breasts to each skillet and cook until golden and cooked through, about 3 minutes per side. Transfer chicken to platter. Bring wine, Sumac juice and broth to boil in 1 skillet over medium-high heat. Whisk in butter-flour mixture and boil until sauce thickens slightly, about 2 minutes. Add prepared Burdock root discs heat through. 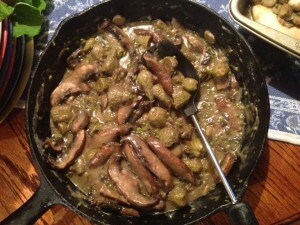 Stir in capers, parsley and remaining 2 tablespoons butter. Season sauce to taste with salt and pepper. Pour sauce over chicken and serve. Thomas Cooper and Lauren Essick fixed this dish for our Forage to Feast event! 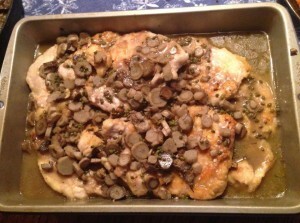 Plus we made this vegetarian version of Chicken Piccata with portabello mushrooms. We added Milkweed pods to this dish. Here is a picture.